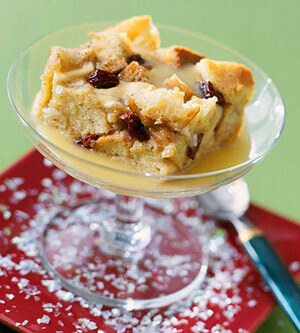 This sophisticated dessert pudding, speckled with bright red dried cherries, is finished off with a buttery whiskey sauce. In a medium saucepan, heat and stir milk, half of the white chocolate and vanilla bean (if using) over low heat until just simmering and chocolate is melted. Remove from heat. Remove vanilla bean. Using a sharp paring knife, split vanilla bean lengthwise. Using the knife tip, scrape out seeds. Stir seeds (or 1-1/2 teaspoons vanilla, if using) into the milk mixture. In a large bowl, beat together eggs, sugar and cinnamon until just combined. Gradually add milk mixture to egg mixture, stirring constantly. In an ungreased 2-quart square baking dish, toss together bread cubes, remaining white chocolate, and dried cherries. Pour milk mixture evenly over bread mixture. Press mixture lightly with back of a large spoon. Cover baking dish with foil and chill in the refrigerator for at least 1 hour. Place baking dish in another larger pan. Pour hot water into large dish to reach 1 inch up side of dish. Bake, covered, in a 350 degree F oven about 60 minutes or until top appears evenly set. Cool slightly on a wire rack. Serve warm with Hard Sauce. Makes 12 servings. * To dry bread cubes, place them in a large, shallow baking pan and bake in a 350 degree F oven for 10 minutes, stirring twice. In a heavy saucepan, cook and stir butter and sugar over medium heat until the butter is melted and the mixture is bubbly. Remove from heat. Gradually whisk into egg yolks; return to saucepan. Cook and stir over medium-low heat about 15 minutes or until mixture registers 170 degrees F when tested with an instant-read thermometer. Remove from heat. Stir in whiskey or milk. If necessary, stir in hot water, 1 teaspoon at a time, to make desired consistency. Serve immediately or cover and let stand at room temperature up to 1 hour (stir in hot water, 1 teaspoon at a time, if sauce becomes too thick). Makes 1-3/4 cups.